After finally selecting my fabrics for the Feathered Tulip quilt I started prepping the blocks to stitch. Once again I used the freezer paper and starch method because I planned to stitch this one by machine. The pieces are quite large and since I already have two applique’ quilts I am stitching by hand I thought I might get this one finished before I pass if it was done by machine. Well, after stitching a few pieces on the machine I quickly decided machine applique’ was not the look I wanted for this quilt. So back to hand stitching. I enjoy using the starch and glue method for prepping my applique because it makes the blocks so easy to take with you and stitch when you have a few minutes of free time. It does take longer to prep the blocks but once that’s finished the stitching goes quickly and all the pieces stay right where you put them. Some consider this cheating (not me) and I don’t use this method for all my applique’ work just the quilts with large pieces. Feathered Tulip has five blocks set on point with setting triangles and three borders. Since the edges of these setting triangles will be on the bias I decided to leave them all together until the stitching was completed. I finished all the stitching last night but will not cut them apart until I assemble the quilt center. The original quilt has just three borders but I plan on making 4 borders for my quilt and they still need to be prepped. 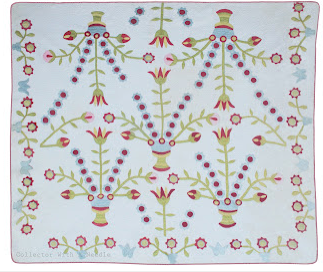 This is a lovely pattern from Dawn at Collector with a Needle. 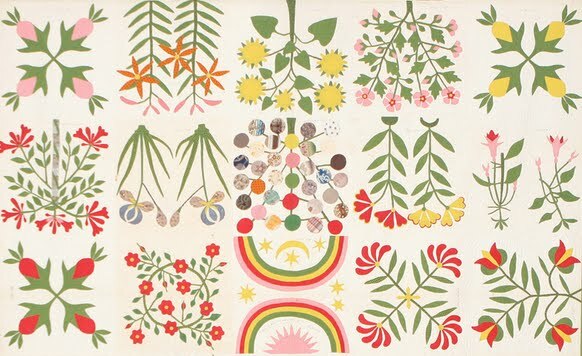 She and her daughter do a wonderful job recreating patterns from antique’ quilts. It's looking great--and you are so quick! Thanks for the clever tip about leaving the blocks connected--I would never have thought of that! What a great idea for the setting tri's, never would have thought that way, I love getting such great tips from other bloggers. Love the dark blue you are using in this pattern. Your blocks look wonderful! Great work on them. Fabulous! 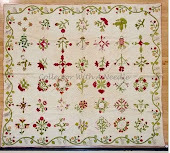 Now what about the machine applique did you not like - was it too flat? Curious. Wow - this is beautiful! I love your fabric selections. I'm looking forward to seeing your progress. I really like the choice of fabrics you have for the blocks--different colors than the pattern for a unique design. I love to applique by hand, but it does take forever!! 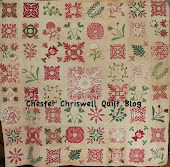 Good luck on the quilts in progress~~may you find some time each day to relax & sew on the blocks. I just discovered your blog. I enjoy Dawns patterns as well. Thanks for the great tip with the triangle background pieces. That makes great sense! You are making such good progress! And I do like the tip for the border triangles. Makes a lot of sense. Your colour choices are beautiful! Isn't it funny how some quilts just demand the hand work?!? Thanks for linking up to Slow Sunday Stitching and I hope you get lots of relaxing time with your stitches today! I don't see why it is cheating to use whatever technique gives you the results you are after. For years people thought anything quilted by machine was cheating too, but look at some of the beautiful work that is done now. I guess we all just need to do whatever works. Very pretty! I agree with Scraphappy, use whatever technique gets you the best results. Your's seems to be working beautifully. I had to biggie size those photos so I could get a good look...what a lovely project. Love that tip too.